My name is Daljit on the forums I took the handle rashidi1 more as a tribute to the late great Rashidi Yekini. I have been part of the SI forum community since 2003 I think, and have been moderating on and off for as long as I can remember. When it comes to Football Manager I have a few projects: I am committed to the on-going development of the game so I help out on the forums, toss in my fair share of comments on the development of the match engine, have my own website for FM called addictedtofm.com (So bloody original! hahaha), and, I even started a YouTube Channel called BusttheNet, how I can do all these things is beyond me, I might be giving the grounds for my second divorce. I love the game of football, my working life for the better part of my 20s-30s featured me actively working in the international football broadcasting scene, so my FM projects were really a kind of love affair. My life with FM deserves a book and someday I will write it, and, it will be littered with hilarious anecdotes including the one time when a whole studio of “Football experts” turned around and wondered how I knew that a scrawny scouser called Steven Gerrard would end up being the next Liverpool captain after he’d been on the field for only 5 minutes in his debut game against Blackburn in 1998. “He’s gonna be the next Liverpool captain..a legend in the making! Who wants to take a bet”. Needless to say, the information from the FM database has helped me financially in more ways than anyone can imagine. Ultimately it’s the love of the game that’s kept me coming back. It all started sometime after uni, I think it was around 1992 when I was on holiday and ended with my face stuck to a computer screen playing Champman. It goes without saying that I really saved a lot of money that trip by going on holiday to stay in one bedroom for 4 nights. It was such a magical game for me, we only had commentary mode in those days, and I was fixated with this game of sliders and numbers and flashing text. Today they warn you its an epileptic threat. I can’t remember when I made Scramjet and for which edition, but that tactic alone got me noticed by a newspaper column back home. In need of some money and trying to prove that gaming could be profitable, I decided to submit a review to the local newspaper hoping they’d take me on as a journalist. The headlines of the story read : Real Madrid 0 – 8 Wolverhampton Wanderers ..CAN YOU BELIEVE IT? From that day onwards I started getting paid 500 dollars for each game I reviewed, FM gave me my first writing gig and I was getting PAID! Unfortunately, my wife refused to accept video gaming would be a viable career choice and the difference of opinions ended up as an irreconcilable difference cited in our divorce proceedings. So in terms of real life achievements – I got a job and lost a wife!, in the game itself I’ve recently gone 300 games unbeaten with WBA using largely one tactical system. So that would probably rank as an in-game achievement. When I first started playing the game in 1992, it was the transfer market, as I got older, it became the match engine, beating it became an obsession, an unhealthy one I’d say. Today I am more focused on the long-term game. Taking a side and figuring out the best way to get them developed to match your long term aspirations and goals as a club is undeniably the one feature I enjoy the most. First Touch. If you can’t control the ball immediately after receiving it then you have issues making intricate systems that depend on the high press and quick passing style. First Touch is the one attribute I focus on training, so much so that my general training programs are fairly customized. I can’t overstate how valuable that attribute is to our style of football. In fact, in my recent save with Geylang International F.C., a club side from Singapore, the lack of first touch in the side has already forced me to make some quick tactical changes so that we can adapt. Without a doubt it has to be the new site started by Sports Interactive called: We are the Managers. Just look at what Chris Darwen did by moving to Spain. My new wife (took me 10 years to find her, luckily no need for a pre-nuptial clause that has FM inserted) has been egging me to quit my job and do something I truly enjoy, and that actually inspired me. It came at the perfect time. And if you haven’t checked it out yet, you really really should. If you are new to the game, take your time and play FMC first. It removes team gelling from the equation and allows you to understand the game a lot faster. You can make tactical changes and you don’t need to worry about how long your side needs to become competent at the system. Use a tactical system you know and understand well. Scout for the missing players in the system. Play the game and keep shouts and player instructions to a minimum until you get comfortable, then dial up the difficulty by tweaking it. That’s it just keep it simple. Find a website you like where the information is presented in the simplest terms possible and go with it. Honestly this game is so simple you can use one tactic into perpetuity. Anyone who says you need an away tactic and a home tactic doesn’t know enough about the engine. You should immediately rule their advice out. I am going to sound brutal here, but there are a lot of people out there giving really bad advice. If you understand your system and understand the weaknesses of your system you will be able to tell in the game if you need to make changes, ultimately these will be tweaks to roles or making some shout changes and that’s going to be the sum total of your changes. Do you need a home tactic and an away tactic? No. Do you need to know which players can fit into which roles? Yes. That’s all you need, then go and enjoy the game. I recently read a thread on the forums, where someone complained about central defenders being pulled out too easily and then he went on to claim it was the engine. 9 times out of 10 you will find either me or Cleon going to counter that by proving that the problem isn’t the central defender it’s the overall tactical shape and the players he has chosen. You can find him at his website at SISportscenter and he has done a lot of work on player roles. Here’s the bonus question from Guido Merry, who nominated you: Which new feature would you like to see in FM16? The fact that I can go 300 games unbeaten is an issue. I would like to see the AI become a lot harder to beat in the future, this means that the AI has to become a lot smarter at making decisions about player development, transfers and tactics and these should all ultimately link back to the goals and aspirations of the AI managers in charge. I doubt that the change will ever come but one can always hope. There’s no „hand on the baton“ question this time as this series comes to an end. This does not mean that there won’t be any interviews in the future, but not at a regular basis. If you have someone you would like to answer these questions feel free to leave a comment and I will gladly get in touch with him. Rashidi gehört zu den Urgesteinen des SI-Forums und ist einer der Veteranen, der sein Wissen mit einer Vielzahl anderer Football Manager teilt. Dies ist der vorläufig letzte Teil der Interview-Serie, die mit seinem langjährigen Weggefährten Cleon begonnen hat, und so schließt sich hier in gewisser Weise eine Klammer. Mein Name ist Daljit; im Forum heiße ich aber rashidi1 als Tribut an den späten großartigen Rashidi Yekini. Ich bin Teil der SI-Forum-Community seit 2003, glaube ich, und moderiere dort fast genauso lange, wenn ich mich recht entsinne. In Bezug auf den Football Manager habe ich einige Projekte: Ich engagiere mich bei der laufenden Entwicklung des FM und helfe im Forum aus, gebe meinen Senf zur Entwicklung der Match Engine und habe meine eigene FM-Website names addictedtofm.com (Sehr originell der Name! Hahaha!) und habe sogar einen YouTube-Kanal namens BusttheNet gestartet. Wie ich das alles schaffe, weiß ich nicht – mag sein, dass es die Grundlage für meine zweite Scheidung legt. Ich liebe das Spiel Fußball, mein Arbeitsleben zwischen 20 und 30 habe ich zum Großteil in der internationalen Fußballrundfunk-Branche verbracht, sodass meine FM-Projekte wirklich eine kleine Liebesaffäre waren. Mein Leben mit dem FM verdient ein Buch und eines Tages werde ich es schreiben. Es wird mit umwerfend komischen Anekdoten angefüllt sein, wie als sich einmal ein ganzes Studio voll mit „Fußballexperten“ zu mir umdrehte und sich wunderte, wieso ein dürrer Liverpooler namens Steven Gerrard der nächste Liverpool-Kapitän werden sollte… Da war er gerade mal fünf Minuten auf dem Feld bei seinem Debüt 1998 gegen Blackburn. „Er wird der nächste Liverpool-Kapitän … eine Legende bahnt sich an! Wer wettet dagegen?“ Unnötig zu erwähnen, dass die Informationen aus der FM-Datenbank mir finanziell öfter geholfen haben, als man sich vorstellen kann. Letzlich ist es die Liebe zum Spiel, die mich immer wieder hat zurückkommen lassen. Das ging irgendwann nach der Uni los; ich denke um 1992, als ich in Urlaub war und schlussendlich vor einem Rechner landete und Champman spielte. Es versteht sich von selbst, dass ich auf dieser Reise sehr viel Geld gespart habe, dadurch dass ich vier Nächte nur im Hotelzimmer geblieben bin. Es war ein magisches Spiel für mich; es gab nur dem Kommentar-Modus damals und ich war gefesselt von diesem Spiel aus Schiebereglern, Nummern und blinkendem Text. Heute gäbe es eine Epilepsie-Warnung. Ich weiß nicht mehr, für welchen FM ich Scramjet gemacht habe, aber diese Taktik hat mir die Aufmerksamkeit einer Zeitungskolumne beschert. Aus Geldnot und um den Beweis anzutreten, dass Zocken profitabel sein kann, habe ich eine Review an die lokale Zeitung geschickt in der Hoffnung, dass sie mich als Journalist nehmen. Die Headline lautete: „Real Madrid 0:8 Bolton Wanderers … IST ES ZU FASSEN?“ Von dem Tag an bekam ich 500 Dollar für jedes Spiel, das ich rezensiert habe. Der FM hat mir meinen ersten Schreibauftrag verschafft – und er wurde bezahlt! Unglücklicherweise lehnte meine Frau Gaming als tragfähige Karriere ab und diese Meinungsverschiedenheit endete in einem unversöhnlichen Bruch, der schließlich im Scheidungsprozess zitiert wurde. Also in Bezug auf echte Erfolge: Ich hab einen Job bekommen und eine Frau verloren! Im Football Manager selbst bin ich aktuell 300 Spiele ungeschlagen mit West Brom, mit größtenteils einer einzigen Taktik. Das sollte als in-game Erfolg zählen. Als ich 1992 angefangen habe, war das der Transfermarkt; als ich älter wurde war es die Match Engine und sie zu bezwingen wurde zu einer Besessenheit – und keiner gesunden, würde ich sagen. Heute konzentriere ich mich mehr auf das Langzeit-Spiel. Eine Mannschaft zu übernehmen und den Weg zu finden, wie man sie am besten gemäß der eigenen langfristigen Ziele entwickelt – dieser Teil des Spiels macht mir ohne Zweifel am meisten Spaß. Ballannahme. Wenn man den Ball nicht sofort kontrollieren kann, bekommt man Probleme, wenn man ein komplexes System schaffen will, das auf hohes Pressing und schnelles Passspiel aufbaut. Ballannahme ist das eine Attribut, auf das ich mich im Training konzentriere, sodass mein allgemeines Training kaum angepasst ist. Ich kann nicht genug betonen, wie wichtig das Attribut für unsere Art Fußball zu spielen ist. Tatsächlich hat mich bei meinem aktuellen Spielstand mit Geylang International FC, einem Verein aus Singapur, die mangelhafte Ballannahme meiner Spieler dazu gezwungen, ein paar frühe taktische Anpassungen vorzunehmen. Das muss ohne Zweifel die kürzlich von Sports Interactive gestartete Seite „We are the Managers“ sein. Man schaue sich nur an, was Chris Darwen geschafft hat, indem er nach Spanien gezogen ist. Meine neue Frau (es hat mich zehn Jahre gekostet, sie zu finden; zum Glück bedurfte es keiner FM-Klausel im Ehevertrag) hat mich dazu angestachelt, meinen Job zu kündigen und etwas zu tun, was mir wirklich Freude macht und da hat mich das wirklich inspiriert. Es kam zur perfekten Zeit. Also falls du das noch nicht gesehen hast, solltest du es dir wirklich, wirklich ansehen. 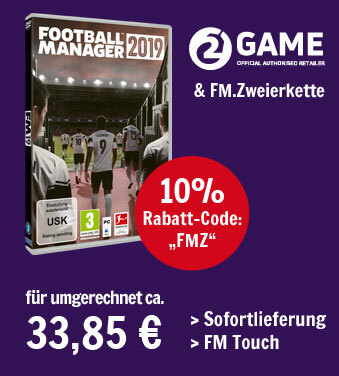 Wenn du neu beim Football Manager bist, nimm dir Zeit und spiele zuerst FMC. Er streicht die Teamführung (sprich: Einzelgespräche etc.) aus der Gleichung und erlaubt es dir, das Spiel viel schneller zu verstehen. Du kannst taktische Änderungen vornehmen ohne dir um die Eingespieltheit Sorgen zu machen. Nutze eine Taktik, die du gut kennst und verstehst. Studiere deine Mannschaft und schau, wer wo spielen kann. Scoute nach den Spielern, die in deinem System fehlen. Spiel das Spiel und halte Team- und Spieleranweisungen einfach bis du dich auskennst und dann erhöhe die Schwierigkeit, indem du mehr Anpassungen vornimmst. Das ist es – halte es einfach. Finde eine Website, die du magst, auf der die Informationen so einfach wie möglich dargestellt werden und halte dich danach. Ganz ehrlich: Das Spiel ist so einfach, dass du eine einzige Taktik bis in alle Ewigkeit benutzen kannst. Jeder der behauptet, dass man eine Heim- und eine Auswärtstaktik braucht, weiß nicht genug über die Engine. Du solltest nicht auf ihre Ratschläge hören. Das mag brutal klingen, aber es gibt viele Leute, die richtig schlechte Tipps geben. Wenn du dein System verstehst und seine Schwächen kennst, wirst du im Spiel wissen, ob du Änderungen vornehmen musst. Letzlich wird es um die Anpassung von Spielerrollen oder Teamanweisungen gehen – um mehr geht es nicht. Braucht man eine Heim- und eine Auswärtstaktik? Nein. Muss man wissen, welche Spieler welche Rollen ausfüllen können? Ja. Das ist alles, was du brauchst – dann leg los und genieß das Spiel. Gerade neulich habe ich ein Thread im Forum gelesen, wo sich jemand beschwerte, dass seine Innenverteidiger zu leicht aus der Abwehr gelockt würden und er gab dann die Schuld der Match Engine. In neun von zehn Fällen widerlegen das entweder Cleon oder ich, indem wir aufzeigen, dass das Problem nicht beim Innenverteidiger liegt, sondern an der Taktik allgemein und den ausgewählten Spielern. Cleon kann man auf seiner Website sisportscentre.com finden, dort hat er auch viel über Spielerrollen geschrieben. Hier ist die Bonus-Frage von Guido, der dich nominiert hat: Welche neue Feature würdest du gerne im FM16 sehen? Die Tatsache, dass ich für 300 Spiele ungeschlagen bleiben kann, ist ein Problem. Ich würde mich freuen, wenn die KI in Zukunft deutlich schwieriger zu schlagen wäre. Das bedeutet, dass die KI deutlich cleverer werden muss, was Spielerentwicklung, Transfers und Taktik betrifft und die Entscheidungen diesbezüglich sollten direkt an die Ziele und Ambitionen der verantwortlichen KI-Trainer geknüpft sein. Ich habe zwar meine Zweifel, dass diese Änderungen jemals kommen werden, aber die Hoffnung stirbt zuletzt. Daljit aka Rashidi bloggt auf addictedtofm.com und twittert unter @bustthenet. „Match Engine geschlagen“, „Jeder der behauptet, dass man eine Heim- und eine Auswärtstaktik braucht, weiß nicht genug über die Engine.“ „300 Spiele ungeschlagen“. Du würdest also sagen, dass er das Spiel zu gut spielt bzw es von den Entwicklern gar nicht gedacht ist, dass man dieses Spiel so gut spielen sollte? Oder denkst du er nutzt Fehler in der Spielmechanik aus? Sozusagen als Exploits? Kann man davon bei diesem Spiel überhaupt reden? Leute wie er oder Cleon (der übrigens die UEFA B-Lizenz besitzt) haben nicht nur ein großes Wissen, was den Fußball an sich betrifft, sondern durch ihre jahrelange Nähe zu SI auch ganz andere Einblicke in die Match Engine (bis runter zu den Attributen) als unsereins. Das heißt nicht, dass er Fehler exploitet – es trifft halt nur eine große Vertrautheit mit dem Spiel auf großes Fachwissen. That’s it. Dass sich das nicht eins zu eins auf uns Normalsterbliche übertragen lässt ist klar – aber den ein oder anderen Kniff und Ratschlag kann man allemal mitnehmen. Wie, wenn nicht an den Erfolgen der Mannschaft, sollte den ein guter vom schlechten Spieler unterschieden werden können? An dieser Stelle finde ich es eher bemerkenswert, dass Spieler wie Rashidi noch Lust auf das Spiel haben. Aber gut… Das Spiel birgt genug Herausforderungen. Singapour zum Beispiel. Ja, sehe ich ganz genauso. Eine Einschränkung: den Zufall gibt es auch im FM – der Ball landet ja nicht an der Latte, weil der Spieler zu wenig Abschluss hat, sondern weil es im Bereich des Möglichen liegt. Ich vermute, dass es einfach eine Bandbreite von möglichen Ausgängen einer Aktion gibt, bei der die Höhe der relevanten Attribute die WAHRSCHEINLICHKEIT eines erfolgreichen Ausgangs bestimmen. Dennoch wird am Ende gewürfelt. Da – wie an vielen anderen Stellen – sind sich der FM und der reale Fußball sehr ähnlich: im Prinzip geht es nur um die Minimierung des Zufalls. Und selbst bei Attributen ist ist ein direkter Vergleich nicht immer so einfach: selbst wenn der Gegner 4 Punkte schneller ist, kann er das dann aber immer abrufen, wenn mein Spieler dafür 6 Punkte mehr Ausdauer hat? Was ist mit Einsatzfreude? Etc pp. In die Zusammenhänge haben Rashidi und Co tiefere Einblicke als wir.